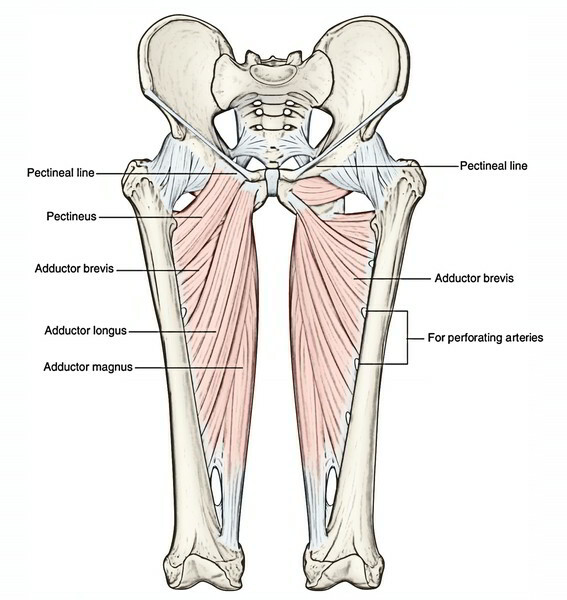 Pectineus is a flat quadrilateral muscle which is located in the floor of femoral triangle between psoas major laterally and adductor longus medially. It appears from the pecten pubis, upper half of the pectineal surface of the superior ramus of pubis and pectineal fascia. The muscle slopes downward, backward, and laterally to be added along a line stretching from the lesser trochanter to the upper end of the linea aspera. It’s supplied by 2 nerves. The anterior fibres are supplied by the femoral nerve and the posterior fibres by the anterior section of the obturator nerve. It adducts the thigh in the hip joint. Which is a flat quadrilateral muscle, located in the floor of femoral triangle? How many nerves supply the pectineus muscle? Which nerve supplies the Pectineus muscle? What is the action of Pectineus muscle? Adduction of thigh in hip joint. Weak plantar flexion of the ankle. Maintains the lateral longitudinal arch. Lateral rotation of the thigh.